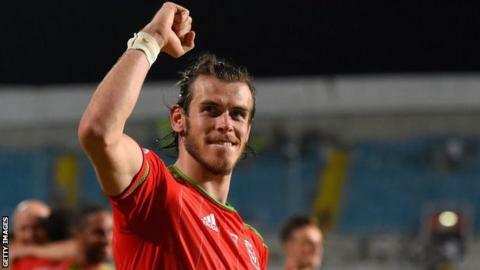 Wales goalkeeping legend Neville Southall says Gareth Bale and his Euro 2016 contenders may be the nation's best team since they reached the 1958 World Cup finals. He expects Chris Coleman to guide his side to France next summer by securing the points they need next month against Bosnia-Herzegovina or Andorra. "They're probably the best [Wales] team since 1958," said Southall. The former Everton star won 92 Wales caps, but none at a major finals. Drawing 0-0 with Israel earlier this month left Wales needing just one point from an away game in Bosnia-Herzegovina on 10 October or at home to group minnows Andorra on 13 October. Southall said Wales are in that position in Group B because: "They're probably the most settled squad we've had for a long, long time because they have more round pegs in round holes." Wales' record cap holder believes the current team "fit together" better than any team since the era of Charles, Ivor Allchurch and Cliff Jones. And he says while Real Madrid star Bale is the star player, others "can do the job". "They're a better team than people give them credit for because you look at Gareth [Bale] - I think he's the only one that can do stuff," Southall told BBC Radio Wales. "But we played teams all over Europe and all over the world that only had one star player and sometimes they've absolutely murdered us. "Wales [now] are no different. They only have one main man. But they have other people who can do the job. "I think they're probably the best team since 1958 - maybe not man for man compared with lots of other teams. "But I think overall they fit [together] better than any other team has fitted since '58… probably one of the best teams we've ever had in terms of that."